As audience members arrived at the Boston venue this past Monday, we asked the first 50+ who walked through the door to fill out a simple half page form. We wanted to better understand who we were talking to, and what their pressure points or stressors are. It helped to know this in that we could emphasize what is also applicable to business professionals. We all wrestle with self-doubt, so it’s not just entrepreneurs struggling with Imposter Syndrome. We all struggle to achieve work-life balance and finding time for exercise/hobbies, although entrepreneurs suffer more from fatigue. 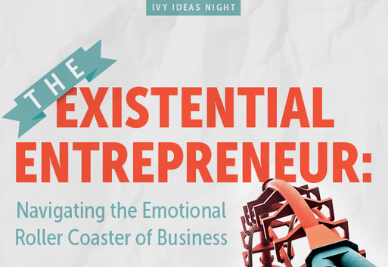 Entrepreneurs worry more about income/finances, which is a significant stressor in life. Employees struggle much more the notion of taking chances. It makes sense of course that entrepreneurs are less risk averse. By the way (and we’re not getting a kickback for saying this), the IVY folks are fantastic hosts. Clearly, it’s a great network that entrepreneurs should think about joining. Click HERE for the link.